This episode focuses on the Northern California CrossFit Games Qualifying Round with another on-the-scene report. 00:00 - 08:00 Pat Barber, Part 1 - on site for the Nor Cal Games Qualifier. 08:00 - 13:22 An on-the-scene interview with the day’s 1st-place female finisher, Brianne Feudel. 13:22 - 17:20 Pat Barber, Part 2 - on site for the Nor Cal Games Qualifier. 17:20 - 19:25 CrossFit RRG - pre-recorded comments from CF Affiliate owners on the need for such a program, and their personal reasons for participating. 19:25 - 37:08 An interview with Dave Millar, 1st-place finisher in the Southern California Games Qualifications from 2 weeks ago. For this interview Dave is on-site at the Northern Cal qualifications and provides a spectators perspective on the current event. 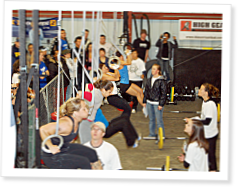 The next CrossFit Radio Weekend Edition show airs live on Saturday, May 10th, 2009, at 6PM PDT.